For the song by In This Moment, see Adrenalize (song). 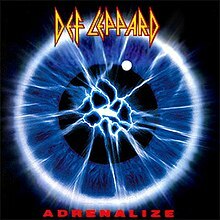 Adrenalize is the fifth studio album by English rock band Def Leppard, released on 31 March 1992 through Mercury Records. The album was the first by the band following the death of guitarist Steve Clark in 1991. "We had recorded demos on multitrack," recalled fellow guitarist Phil Collen. "I was sitting there with him when he played the original parts. I could relay that. But it was like playing along to a ghost." Adrenalize debuted at No. 1 on the U.S. Billboard 200 and peaked at No. 1 on the UK Albums Chart. In a four star review for Rolling Stone, J.D. Considine wrote "Adrenalize is so relentlessly catchy that it almost seems as if the band is about to abandon its heavy-metal roots for the greener fields of hard pop." Tracks 5 & 6 taken from "Have You Ever Needed Someone So Bad" single. Tracks 7 & 8 taken from "Tonight" single. Track 9 taken from "Make Love Like a Man" UK single and "Two Steps Behind" US single. Track 10 taken from "Two Steps Behind" single. Tracks 11 & 12 taken from "Let's Get Rocked" single. Phil Collen – all guitars except acoustic guitar on "Tonight", Cockney rhyming rap on "Make Love Like a Man"
Rick Savage – bass guitar, acoustic guitar on "Tonight"
Phil "Crash" Nicholas – keyboard on "Stand Up (Kick Love into Motion)"
^ "D E F L E P P A R D . C O M". Web.archive.org. 21 December 2001. Retrieved 12 August 2018. ^ Christgau, Robert. "Def Leppard". Robert Christgau. ^ J.D. Considine (16 April 1992). "Adrenalize | Album Reviews". Rolling Stone. Retrieved 2 November 2011. ^ "Allmusic (Def Leppard charts and awards) Billboard albums". ^ "Def Leppard chart stats". Archived from the original on 27 May 2012. ^ Considine, J.D. (16 April 1992). "Adrenalize". Rolling Stone. "High 'n' Dry (Saturday Night)"
"Rock! Rock! (Till You Drop)"
CMT Crossroads – "Taylor Swift and Def Leppard"
This page was last edited on 16 March 2019, at 21:52 (UTC).